Everything is more exciting with cake and balloons! Especially a birthday! So send some excitement and fun your father's way with this colorful and festive birthday greeting card. He will think it's great! It features balloons and a perfect birthday cake with brightly lit candles! This is your dad’s special day that only arrives once a year, so start his day off with a smile by sending this joyous birthday card his way! 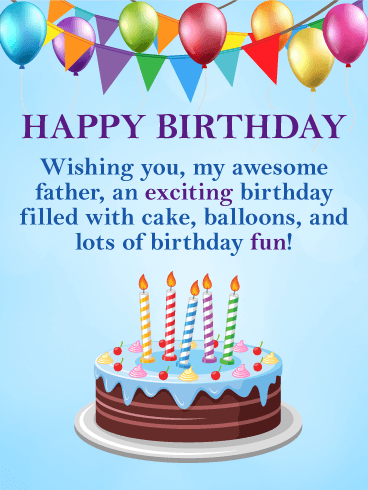 HAPPY BIRTHDAY - Wishing you, my awesome father, an exciting birthday filled with cake, balloons, and lots of birthday fun! Satisfy your dad’s sugar cravings with this sweet treat for his birthday! A birthday party is the perfect time to indulge without judgment. Fingers covered in powdered sugar, a nose with a dollop of frosting. And knowing your dad, he might have put it there himself just to be funny. So grab a pointy hat and join your dad in his silliness to help him celebrate his birthday. It’ll make his day a million times better. Make this birthday a celebration your father will never forget! Birthdays have a habit of blending together, was it your ninth or seventh that was zoo themed?, but they all leave behind a sense of warmth and love. They are blessed days, full of moments that crystalize in our hearts so we can feel their joy forever. For your dad’s birthday, fill your father’s heart with unforgettable joy and send him this card. Who doesn't love a superhero, especially when it's your father! Good dads are like your very own hero. They watch over you, protect you, and care for you. 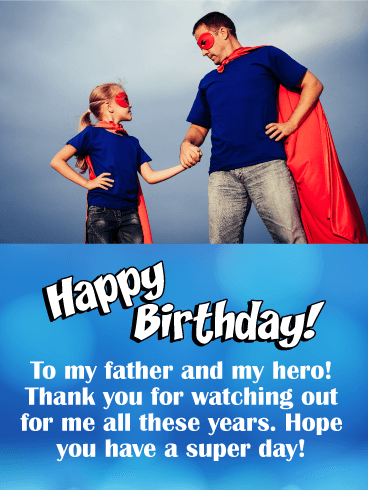 This fun birthday card shows a father and daughter superhero team, along with superhero comic book type lettering. It's perfect for showing your father you recognize how much he cares about you. So wish your awesome father a super day with this creative birthday card! 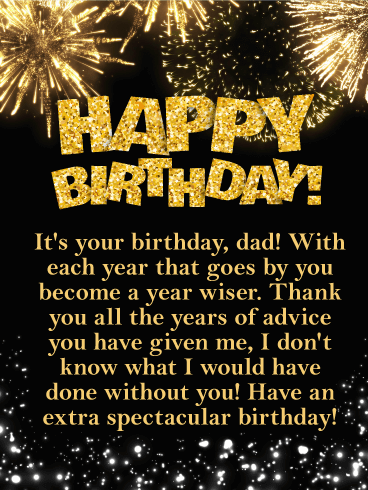 Send a little sparkle to your father on his birthday, it would be a great way to get the celebration started! This happy birthday card features everything a father would love, a cupcake and a special message from his child. 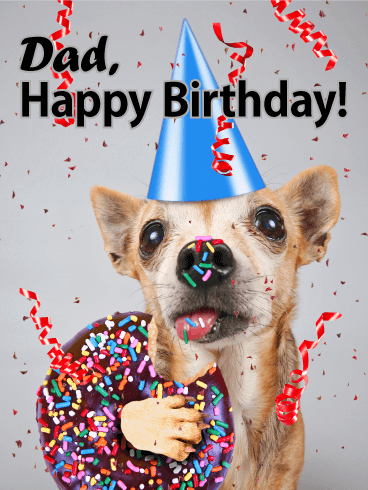 It thoughtfully lets your dad know that you are wishing him a birthday filled with love and cheer! 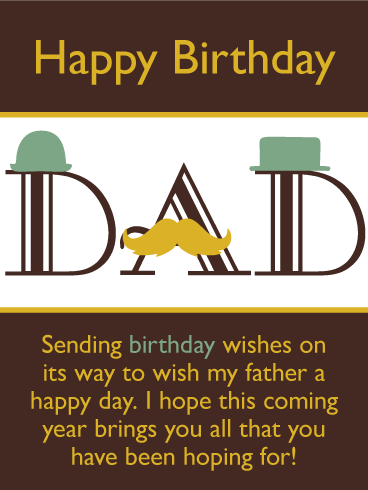 This great birthday card is perfect if your goal is to make your father happy on his birthday! If you have one of those fathers who loved spending time with you as a child, and still does, then it's time to tell him how much you appreciate it with this thoughtful happy birthday card! It features a wonderful image of a father and son playing together and creating memories. So be sure to send some happiness and fond memories your dad's way by sending this fantastic birthday card without delay! Father's are the best! They love us and give us so much joy. 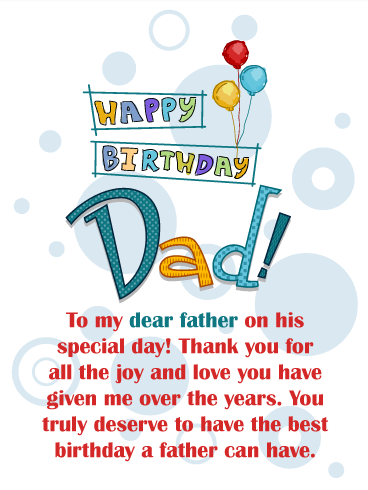 So send your dad a birthday card that lets him know how much you appreciate all that he has done for you, it will brighten his day! It will also remind him that he deserves the very best on his birthday! 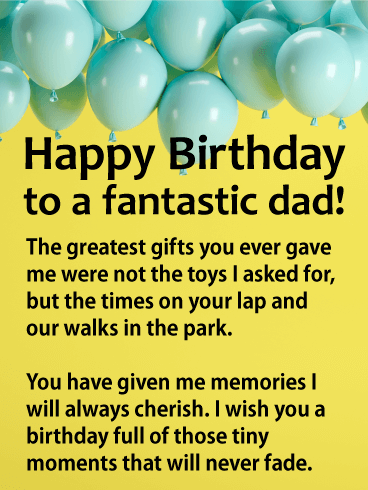 Colorful balloons and creative lettering make this happy birthday card very festive, it will add to the excitement and joy of your dad's birthday! Fireworks of gold bursting in the evening sky along with glittering gold letters set the stage for this exciting happy birthday card. A father's birthday is certainly a grand occasion and deserves a birthday greeting card that goes above and beyond to make him feel special. With its eye-catching design and thoughtful words of wisdom and thankfulness, your dad will cherish this birthday card, especially because it is from you, his son or daughter. Receiving golden balloons and a perfect birthday cake, now that's what every father would hope for on his birthday! So give him what he deserves with this spectacular happy birthday card! 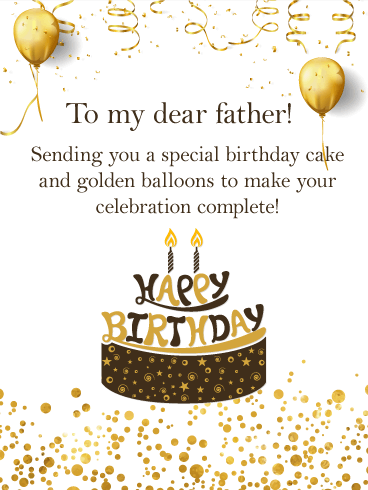 The golden ribbons and confetti are the final touches that bring everything together in this birthday card made just for your dad! 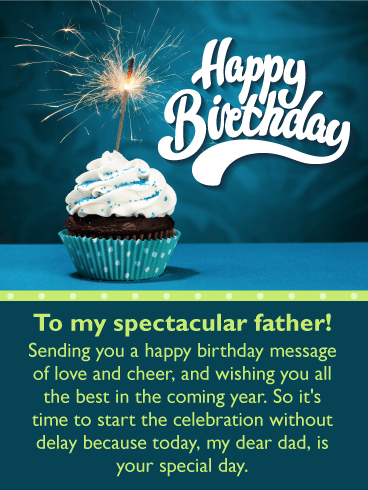 Don't make your father wait a second more, send this happy birthday card to him while the celebration candles are still lit! Fathers are wonderful, they are someone to be admired and looked up to. They do so much for their children, and that's why it's important to send them a special happy birthday card. This touching birthday card features an adult child and his father walking along the beach. Father and son time at its best! 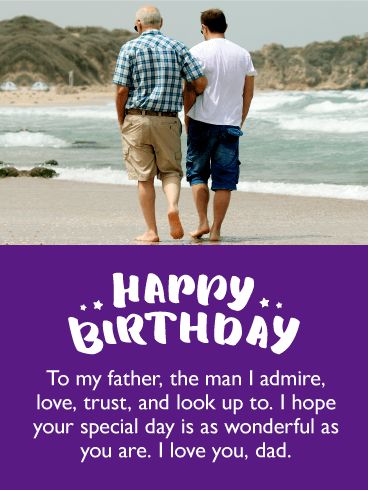 Tell your dad how much you love him by sending this meaningful happy birthday card to him today! 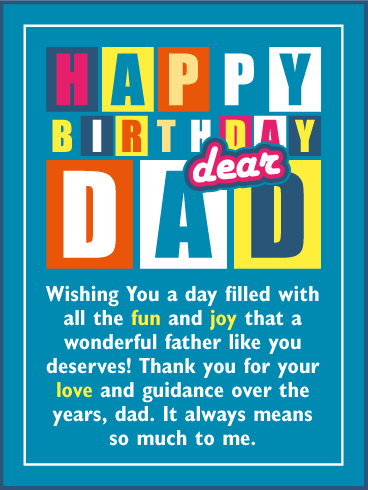 Fill your dear father's day with the joy that he deserves by sending this creative and colorful happy birthday card! The large words, "Happy Birthday Dear Dad", certainly pop off the page and will be the first thing your father will see! 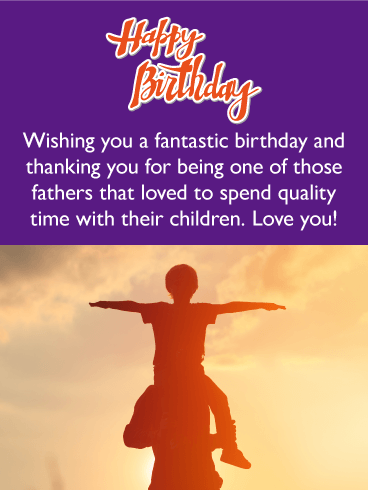 His guidance over the years is worth a thank you and this birthday card will do just that, as well as let your father know how much it has meant to you! 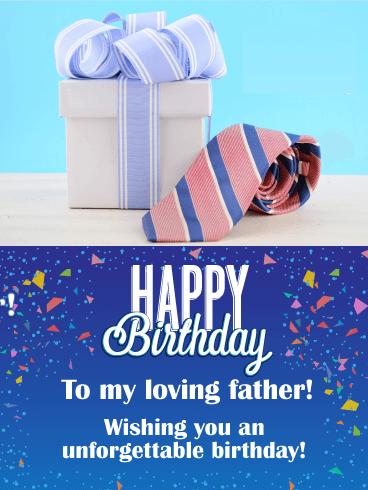 Fathers are known for wearing ties, especially on important occasions, and what could be more important than his birthday! That's why this fantastic happy birthday card would be so perfect for your dad’s special day. It displays a great photo of a stylish tie and a decorative gift box that your father will surely love. The best part is that this happy birthday card will wish your dad an unforgettable day! Is your father a little on the conservative side, if so, then this classy birthday card will suit him just fine! It features fancy lettering with icons such as a top hat that give it some style. The simple colors of brown, tan, and green give it a more sophisticated look that your father will love. So be sure to send your father this happy birthday card that was designed just for your dad!